In the Design Gallery anyone can try the 3Dream planner, no sign-up required. Just Click on a room scene to be taken to it's details page. From there you can browse "snapshots" of the room, see a list of the items in the scene and even launch the room scene in 3D by clicking the "Launch this Scene" button. 3Dream.net - The best online 3D space planning software for interior designers, decorators, furniture retailers, builders, retailers, homeowners and anyone wishing to create realistic living spaces fast and easy. Draw your rooms in 2D and switch to 3D for real-time rendering (just like a video game) to complete your detailed room design with finishes and decorative accessories. 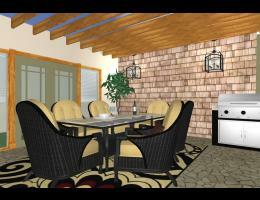 Drag 'n drop thousands of 3D products to visualize all the 'what-if's any home or office renovation project.